CorePower Yoga is popping up all over. Founded in Denver, Colorado, in 2002, CPY now has 170 studios nationwide and is expanding quickly. If you're a fan of power yoga or like to try new yoga trends, CPY can be very appealing. If you feel lukewarm (at best) about core work or aren't sure how much you like hot yoga, your interested may be tinged with trepidation. And potential strike three is the unmistakable flavor of corporate branding that permeates CorePower Yoga's website and other promotional materials. If you prefer your yoga local and intimate with an ​everybody-knows-your-name vibe, it may be too much to handle. But despite the prospect of a strike-out, CPY does have something very good going for it: the first week is free. As it turns out, level 1 CPY classes are not heated. Though intended as an introduction, the class is plenty challenging, even at room temperature. Level 1 classes follow a set series, which includes standing poses, balancing, and plenty of vinyasas. Although core work was included, it played no larger role than in most flow classes you take these days. The teacher was friendly, knowledgeable, and generous with her adjustments. She also offered students the chance to opt out of hands-on adjustments, so you're covered whichever your preference. In level 2 classes, the room is heated and the teacher has more discretion in sequencing the poses. Expect to move right into a vigorous flow in which sun salutations lead to standing poses, arm balances, and inversions, before coming down to the mat for the inevitable core work. Again, the core exercises are fairly typical of what you find in most vinyasa classes. Level 2 includes more standing balances, which also work the core. Though the heat was hot, it was not unbearable. The teachers encountered for this review were comfortable using the Sanskrit names for poses and ending with a namaste, but other than that, the classes were very much grounded in the physical practice which is typical of power yoga. If you fear (or don't like) core work and aren't a fan of heat, you may be pleased to find that neither will hinder your enjoyment of CPY classes, though it may end up being a testament to the quality of the teachers as was the case for the classes taken for this review. But if you have a distaste for corporate yoga, that may be less easily dispensed with. The corporate is strong here, which is not surprising given founder and CEO Trevor Tice's background as the owner of a multi-million dollar IT company. The studio architecture even resembles an office, with long carpeted hallways leading to the mirrored practice studios and dressing rooms which would not be out of place in an upscale gym. Showers are provided as well as lockers and free tampons. A crowd of young women clad in the latest workout garb chatted in the locker room after class about how much these enjoyed these amenities, but you might be put off by the signs referring to the yama and niyamas to encourage asteya (not stealing) and saucha (cleanliness). 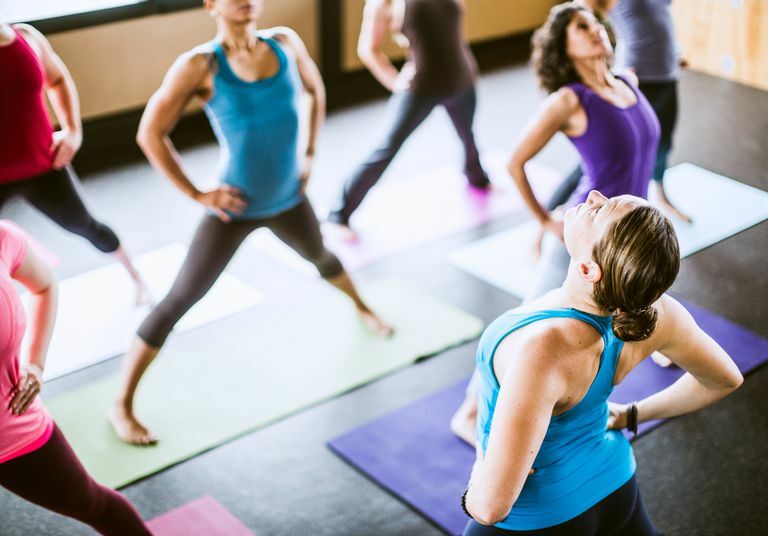 Power yoga has long had its place, serving people who want an asana-based workout, and CPY is very much in that tradition even offering yoga classes that incorporate free weights. In the past, we've written about the pros and cons of doing yoga at a dedicated studio or at the gym. Enterprises like CorePower Yoga are doing away with that distinction by creating a gym for yoga. There are upsides to a corporate yoga situation: consistency, a packed schedule, and an increasingly national presence. However, each CorePower studio hires a lot of the best local teachers. We've been consistently impressed with the quality of the instruction and there is ample opportunity for regular students to build the kind of ongoing relationships with their favorite teachers that are usually the hallmark of neighborhood studios. Offering a free week to new students is a stroke of marketing genius; take advantage of it and then decide for yourself when CPY arrives soon at a location near you.